The hair is great and I am sure people will enjoy using it on the official DAZ release of this new character that we are discussing in this thread! They look the same to me, with only slight variations IMO. I have to say I really like Olympia and her default skin texture a great deal. It looks realistic to me, and also applies well to v6. I also love the hips which are lovely and natural given her size. Whoever did the default texture did an excellent job of making the skins look golden and lovely without the headbloom which was on default v6 and quite distracts me. One thing I have noticed is a seam that runs from her navel to her groin, and one around her waist. It is very small and hardly visible but there. Since I don't tend to render nudes, this isn't an issue for me, but wondering if anyone else has noticed this? Anyway, while I don't particularly find the clothing in the bundle to my taste, I think the default figure is very well done, and the texture quite nice. Thanks for making a great character DAZ! I can see she will be of quite use, and the skin as well! What shading rate do you use? I don't have Olympia yet, but on other textures, such as the old Amy Elite texture, if you dropped the shading rate the seams went away. If you use the default 1.00 try lowering it to .20 or so. I'm wondering something about FW Diana - in what way is Olympia a required product? The head and body morphs are custom and Olympia isn't dialled in at all from the preset character. The UV set used is V5. I have wondered this too. Kori and Nidale also don't seem to be using the Olympia shape or UVs, but still list Olympia 6 as a required product. Perhaps this is hidden somehow. I don't see it on the shaping tab. When I select "Currently Used", it only shows the character head and body shape as used. And if it's hidden, WTF? Why isn't it with the rest of the textures? I've done two very basic renders to show just how different the three figures are. Perhaps they illustrate better just how different the figure shapes are. You will not a rather large difference in not just size but shape of both breast and buttocks on Olympia. Female genitalia use the same texture as the hip. You essentially just need to select the genitalia and then apply the hip texture for the figure to it. If you didn't purchase the pro bundle you probably did not get the custom Olympia UV for the Genitalia, so the Olympia texture may have some distortion. Last chance to get a snowball for these items! Olympia 6 Pro Bundle was in Yesterday's Snowball Featured Items. She isn't in there today. There was a mixup. She's back in the snowball. Today is the last day to get a snowball for the Olympia 6 Pro bundle though. With Kori I don't see the Olympia body getting dialed in, however, there is 0.70 of the Olympia head. For Nidale it is similar, Olympia body morph is at 0 while the head is at 0.50. A tribute to Boris Valejo and his piece named "Αstarte"..but this time featuring Genesis 2 female - Olympia 6 character with some morph fixes directly out of Poser pro 2014 and Octane renderer...a few hours of postwork in photoshop to bring it closer to the oil techique of Boris...hope you like it! 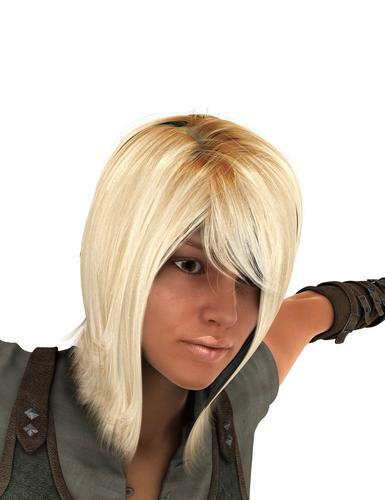 Please remember that this is an Official Daz 3D release Thread, so Off Topic conversations will be removed. Odd Ill have to recheck the final files the body morphs should have matched the head morph dials. Here is a screen shot for Kori. I had display hidden properties enabled. My first render of Olympia...I think she may be my favorite. I have figured out some of why I was seeing different results than Renpatsu. If I load Genesis 2 Female base and apply the Kori body and head shapes, I get the Olympia Head shape at 0.7. If I load the Kori actor in DAZ Formats -> -> People -> Genesis 2 Female -> Characters, then I get only the Kori body and head shape with no Olympia head or body shape. I would expect these two methods to produce the same character. I think the head shape actually is slightly different. I did some more experimentation and what I've discovered is that "Currently Used" does not always tell you the truth about what is currently used. When I load the Kori actor, and show Currently Used on the shaping tab, it show me only Kori Body and Kori Head at 1.0. This is with "Show Hidden Properties" selected. When I go into the Head -> People -> Real World, it shows Kori Head at 1.0 and Olympia Head at 0.7. The Olympia Head shape morph is there, but something has been done in the actor so that it does not show in Currently Used. That indicates that the state of the figure was memorised with all but the custom morphs already set - Currently Used shows not non-zero properties but those that differ from their memorised values. I don't really like the outfits, Jungle Girl might work for, well, jungle girl characters, but it looks to me as if the loincloth might have been rigged to the legs in which case it is pretty much unusable. Not sure about this. There's a Bobby25 outfit that has morphs, which is a really big step forward so that's something. I would very much like to know if the Jungle Girl outfit is rigged in this manner. That very thing is what has kept me from buying any of Bobby25's items since I discovered that 'feature". It would also be nice to know if the Prehistoric Princess gets away from that. If both items still have the loincloth stuck to the thighs then I'll know to steer clear of the Pro Bundle. As far as I can tell, the Jungle Girl loincloth is rigged to the thighs. It does have a few morphs to make up for that, so it's not completely useless, but like most items of that kind I have encountered at the DAZ store, it is very limited. Nothing I would normally spend money on. Very nice Trish, what lighting did you use? I like her as well her body shape is nice and her face quite pretty. Currently used shows you properties that are at a different value than their default or load value. This means that if you load Genesis 2 Female and manually apply the Victoria 6 shape then the Victoria 6 slider will show up under currently used. If you load Victoria 6 directly into the scene the Victoria 6 slider will be set to 1, but it won't show up under currently used unless you change that value since "1" is the default state.